If we were meeting for coffee, I would tell you how getting up to go to bible study this morning was so hard. . . but that an event that happened on Sunday made me finally get up and go. . . I would tell you how I spent the night in bed fighting off waves of nauseousness since I pushed myself too hard at Crossfit when it was almost 100 degrees outside . . . but other than that, I would tell you how much I love Crossfit and the wonderful people I have met. We would probably talk about how much women are "supposed" to do in our generation. I would tell you about how I volunteered at a luncheon at the Junior League and overheard women talking about all the committees and boards they were on and how they had families too . . . they discussed all of their commitments with such pride. . . but my immediate thought was which comes first, family or volunteering? I would tell you that I have such a problem with over committing and how hard it is for me to say no. . . .We would talk about how for years I have had problems with nauseousness (which is the Lord's way of FORCING me to slow down) . . . sweet Nate always just takes care of me with water, making me lay down, turning the lights out, and having Gus get on the bed to cuddle with me. . . It is in those quiet times, when physically I cannot do ANYTHING (even though I have nine million things in my head that I NEED to do) that the Lord says, slow down. . . i am in control. . . whatever you are racing to can wait.. . and after laying down for a while, I can complete what I need to do. . . my hair might be in a bun instead of straightened, but oh well. . .
You would probably ask what happened on Sunday. . . and I would not be able to quit smiling. . . 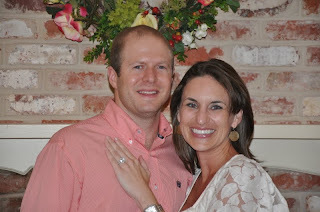 I would tell you with such excitement that my little brother proposed to my sweet friend, Rebecca! We would talk wedding details and and my heart would overflow with joy. . . 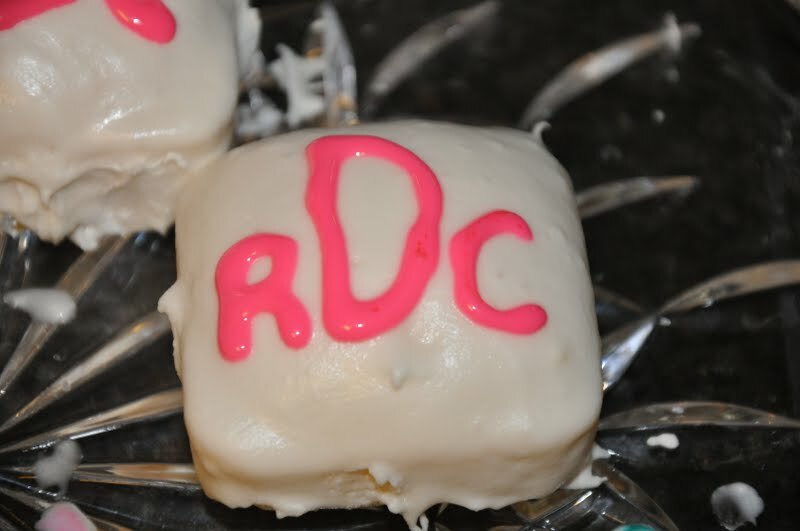 I would describe the icing mess I made making petit fours. . .
due to its precarious height. . . But that the night was perfect in every way and that I am blessed. . . just incredibly blessed. 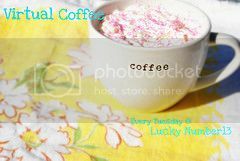 And as our coffee date was ending and I was hugging you goodbye, I would slip you this recipe (and tell you how my dad warns that the smell attracts the neighbors:-) . . . just because I love you! In a 9x13 inch ungreased Pyrex dish, dump the ingredients in the order above. (drizzle the butter over the entire dish) Do not mix. Bake at 350 for 1 hour. i love all your recipes...i haven't been able to try one because well, to be honest, i haven't really cooked or baked anything in quite some time. one day though, i will try some because they always look amazing!! and sidenote...i think i know you're brother. i remembering meeting him a LONG time ago at kanakuk. i think we were kampers together??! crazy...small world! Love that I got to see a few pictures since hearing the story! Thanks for sharing this great post!! This post makes me happy in so many ways! love this and love you!! so happy for them!!! What exciting news for your family! I love wonderful engagement stories :) Your carrot cake looks divine! So happy for Clark and Rebecca!!! And I LOVE dump cake - it's so easy and people are always so impressed because it's so yummy. Another variation is to skip the pineapple and do cherry pie filling on one side of the baking dish and blueberry pie filling on the other, top with the yellow cake, sprinkle over the melted butter, skip the pecans and viola, people think you made cobbler! Love you friend! Yay for Clark! That is so exciting and you cake sounds delicious... way to save that carrot cake too! :) Hope you are feeling better. Oh WOW! So happy that you are gaining a fantastic SIL! That's excellent news, hon. And what a romantic proposal scene. Pretty petit fours! Such a sweet post! 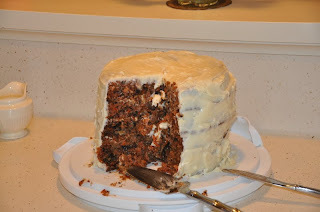 I love the carrot cake tower - it looks soooo yummy! Love you!